Kellogg's was originally founded as the Battle Creek Toasted Corn Flake Company in 1906. The company's founder Will Keith Kellogg is credited with inventing corn flakes along with his brother John Harvey Kellogg. The company was renamed the Kellogg Company in 1922. 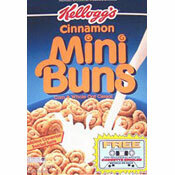 Since that time, Kellogg's has become a multi-national producer of breakfast foods, snack foods, cookies and crackers. For more about Kellogg's, visit their official website.